Lying between the Liberty Wreck and the Drop-Off, is a long stretch of shallow reef that follows the shoreline for around 150 metres. The Coral garden is a rich reef, popular with underwater photographers. It is renown for almost guaranteed sightings of critters that are rare elsewhere; Harlequin Ghost Pipefish, Ribbon Eels, Leaf Scorpion Fish and at night – Spanish Dancer Nudibranchs. 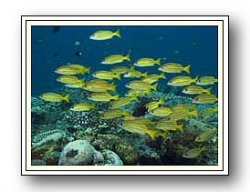 It is also a great place to see schools of trevally, snapper and sweetlip or perhaps a cruising Black-Tip Shark. Depths range from 3-15 metres. This site is also known as Paradise Reef.